Product name: Fidelizer W7/8/server2012 computer optimization software. Reviewed: January, 2015 (updated March 2016). Sadly, I'm old enough to remember the introduction of cassette tape as a hi-fi medium, never mind the arrival of Compact Disc (CD) in 1982. What was supposedly game-changing about CD was that because it used ones and zeros to store and playback the music signal, it would always produce a perfect signal. Of course that wasn't the case, and soon we were introduced to separate audiophile DACs and better transports, and the hunt for the best digital playback system was up and running. The next significant step forward in digital playback was the use of computers. At first, using a bog-standard PC running something like Windows XP fell some way behind the better quality CD players and DAC's but it was desirable as it made selecting music much easier than finding a CD.. Microsoft were aware of the interest in computer playback, and worked to improve the sound quality that their operating systems allowed. Windows 7 was better than XP, W8 better again, and if numerous posts on various audio forums are to be believed, Windows2012 server, is the best to date. Then there are the various Linux operating systems, but for the sake of this review, I am going to ignore those for now. If you are still in the 'ones are ones and zeros are zeros' camp, you may as well turn away now. Not only do the various operating systems sound different when playing back hi-fi quality audio, but they can be improved. Of course it is very difficult to subjectively test all this for oneself unless you have computers with identical hardware running two different operating systems. Fortunately, some of the improvements are easy to hear. Computer audio is gaining popularity for several reasons. First off, it is so practical to have all the music stored on a hard drive, with any album or track available quickly at the click of a mouse button. Secondly, we have come a long way from the first 'audiophile' sound cards. External DACs and converters now offer superb sound quality, often beating the best CDPs. Last but not least, we have available software such as JPlay that is designed to squeeze even better sound quality out of a computer. So, that's how everything is being accomplished in the computer, by being constantly interrupted and, when we play the music back, the computer is not giving its full attention to that job. Like a human being trying to do several jobs at once, it is not doing any one job to the best of its abilities. It's not only the interrupts of the background tasks that can adversely affect sound quality, wi-fi access does too, so shutting that down will make a definite improvement too, as will not using networking. If you control your audio computer using wi-fi, or your music is stored no a network drive, you may not like that idea, and you will then have to decide between ease of use, and ultimate sound quality. Fortunately, the software that I have encountered provides the option of turning off wi-fi, and networking, or not. For quite a while now there have been hints and tips on the Internet for closing down parts of an operating system to optimize it for music playback. Some years ago, I spent far too many hours messing around with Windows XP on a computer that I assigned exclusively to computer audio. Nearly all the hints and tips that I found on the Internet involved going further into the operating system than most users would like to, particularly so if the computer was also depended on for day-to-day use. What was needed was some way of achieving the same results by running a single application that did all the work for us. There have been several free offerings along those lines, and one that I tried from Computer Audio Design worked well using scripts. However, some of the scripts needed to be executed each time that you used the computer. Better still is a piece of software called Fidelizer, and that is the subject of this review. Fidelizer is produced by Keetakawee Punpeng who trades as WindowsX, and comes in three versions. The basic version is free to try, and will almost certainly convince you to buy one of the other two versions. The Plus version is free of the nag screens that come with the free version, and improves sound quality still further. Both these versions require the user to run them each time that the computer is booted. The Pro version makes the changes to the computer permanent and does not therefore require running at each session. Pro also offers users further tweaks to improve the sound quality. I initially downloaded the free version, and tried it on my W8 computer instead of running the CAD scripts. If I was forced to pick which I liked best it would be Fidelizer. The improvement in sound quality is not subtle; detail is improved to an extent where you can much better discern the lyrics of of all but the worst recorded material. Everything else is better defined too. The music comes from a darker background, and the tone is purer, particularly with sounds such as guitar strings. It really is like rediscovering your whole music collection. When you run the Fidelizer program you have several options depending on how your computer is used. For instance you may still want to use that computer for tasks other than playing back music, or you may want to optimize it only for audio playback, and get the best sound quality. Here are a list of those options, taken from the Fidelizer web site. Fidelizer has 4 optimization levels to choose. Default will be Workstation for normal use. Workstation (For general purpose) – It’ll apply only ‘Fidelizer’s core system and resource scheduler optimizations’ This is key feature of Fidelizer and every Windows should have it. Network streaming (Slower system) – It’ll optimize core optimizations in favor of network audio. It also reduce priority of non-audio processes to improve audio performance. Audiophile (Slower system/network) – It’ll optimize core optimizations in favor of pure audio. It also reduce priority of non-audio processes and re-assign core affinity to improve audio performance. Extremist (Full optimizations including stopping system services) – This will perform like Audiophile optimization level but also stopping system services. If you need to keep some services, choose Customize and select either Network features/User experiences. Read more at Fidelizer web site. When you run the Pro version, you are prompted to restart your computer, and then have to wait a little time (probably dependent on the hardware specification) to boot back into Windows while the (many) adjustments are made. The short wait is well worthwhile! I went for the 'extremist' level as I was not using that computer for anything but playing music. Pro takes the quality to yet another level. There is clearly more transparency, enough that you don't have to listen for it. The music comes from an even 'blacker' sound stage, and sounds relaxed but not soft. It's as though you have been listening to your hi-fi just outside of the room, and then gone in and sat in front of it. This is not one of those tweaks where you need to listen for a few days to realise that something has changed for the better. And there's the bonus of just being able to turn on the computer, open your music player, and be ready to play back some music. Fidelizer resulted in the biggest single improvement to my hi-fi that I have yet encountered! There's nothing much more to add although I should say that both the trial, and Pro, version of Fidelizer worked faultlessly while setting up, where there is nothing much to do except copy the downloaded file to the Desktop, and double click it to run it. It takes just minutes to have Fidelizer up and running. Neither version produced any problem, and everything worked as it should have. Of course nothing can be 100% guaranteed to work with every system and computer so WindowsX, who produces Fidelizer, offers email support to help sort out any problem if the user encounters one. If for some unlikely reason that you can't get Fidelizer to work on your computer, you will be refunded. I know that some people are reluctant to pay for software tweaks but you can try Fidelizer for yourself at no cost. The trial version will give you a hint of what this software can achieve, but trust me, the Pro version goes much further, and in my opinion is well worth the asking price. Fidelizer resulted in the biggest single improvement to my hi-fi that I have yet encountered - it really is that good. Just to make it quite clear, Fidelizer is not a music playback program, you still require something like Foobar or JRiver media centre. And if you already have JPlay, Fidelizer enhances what that does, and is not a replacement for it. Product - Fidelizer Pro 7.0. Cost - $69.95 (less 10% for returning customers). Nothing much stands still in the world of hi-fi, and of course, even less, in the world of computing. So I wasn't surprised to be asked if I would review the new version of the Fidelizer software. The version under review here is called Fidelizer Pro 7.0, but there is also a new version of the Fidelizer Plus software that does much the same as the Pro version, but has fewer features, and costs $39.95. If you have used Fidelizer before, there is no change in how you purchase, download, or install it, or indeed how you use it. If you haven't used it before, let me repeat that it is simplicity to purchase and install, and get it working. This software has the 'feel' of something that is written by an expert, and I have never had any issues with it crashing, or causing any problems with the computer that it is installed on. 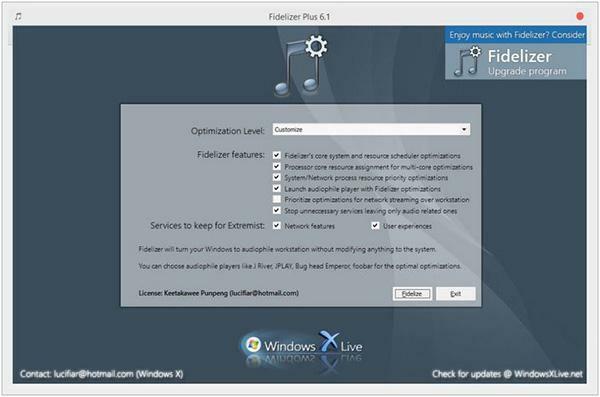 Fidelizer Pro 7.0 doesn't appear to do much (or anything) more than the earlier version as regards optimizing a Windows operating system itself to get the best audio playback. What it does offer over the older version is more options to get it working optimally with various audio applications, for instance Foobar, JPlay, or JStreamer. It also "has system configuration tweaks that greatly improve audio performance with start-up features". Since I reviewed the earlier version of Fidelizer, I have acquired a newer laptop that is running Windows 10, with JStreamer or Foobar as the audio playing options. While running Fidelizer 7.0 certainly made a clear improvement to the overall sound quality, I didn't (initially) feel that the improvement was quite as much as with the Windows 8 computer. That's possibly because the audio output quality with W10 is marginally better, or may be because the Fidelizer experience was not new to me. However, after a couple of weeks of using both the W8 and W10 laptops, I could detect that the W10 with the newer version of Fidelizer Pro did sound slightly better. The new version also provides more in the way of optimization, and it's reassuring to know that it is designed to work with the audio playback software that you are using, rather than possibly conflicting with it. If you are computer-phobic, please don't worry, the interface for the optimization is in plain English, and it is simply a matter of choosing the options that you want or need. And the Fidelizer website provides plenty of clear and detailed help. One feature that I continue to like with Fidelizer is that it opens up the music playback application when you start your computer, so that it is ready to play music when it is booted up, and Fidelizer is running. As previously, there are three levels of optimization depending whether the computer is for day-to-day use, whether you want to optimize it more for music playback, or whether you only want to use the computer for music playback, and can afford to disable many of the other features that are not required for music playback. In short, everybody is, or should be, catered for. I personally recommend having a computer that is used only for music playback, but I realise that is not possible for everybody. As I was reviewing Fidelizer Pro 7.0 around the time that I was reviewing the iFi iPurifier2, it did make me wonder which of the various options that are now available for improving a computer as an audio source make the most improvement, and do we really need all of them? For instance, if you are starting with a new computer, is it better to buy JPlay or Fidelizer? In my mind, it makes sense to start with Fidelizer as it works on the whole operating system, and I think that anybody would more clearly hear the improvement that Fidelizer makes, doing it that way. Then you could try JPlay or JStreamer against something like Foobar to see which you prefer. The iPurifier2 is hardware of course, and probably shouldn't be compared to the software upgrades, but that would be my recommendation as the next upgrade after Fidelizer. Do we really need all these products? Clearly some overlap each other in the job that they do, but I find that all three of the products mentioned in this paragraph combine to provide the best sound quality. However, the amount of improvement does diminish the more of them that you use. And to be very honest, I am finding that the quality of audio from my two hi-fi systems is so good now that I hardly ever think about making it better. It is only when offered these products for review that I realise that there is some more improvement to be 'squeezed' out, but I am reminded of the law of diminishing returns, and no longer expect a huge improvement with every upgrade. That said, I repeat, that if you are starting off with a Windows operated computer for your audio playback, Fidelizer will give you a very solid foundation on which to build, and it still retains my strong recommendation. Even if you already use JPlay or something like it, I would still recommend that you try Fidelizer. I'm pleased to see that these types of products are offered at affordable prices, and with the option to try them prior to parting with your money.